It’s been a few years since I wrote a review of books I’ve read, so this isn’t going to list everything I’ve read since 2012, just a few of the best books or series. For the entire list of all books, see the library page. So, 2015. I set a goal of 50 (new) books to read in the year, same goal I’d set the previous few years. I read 70 in total. This doesn’t include re-reads of old favourites, just new books. For 2016 I’m going to set a goal of 75, that’s an average of 6.25 books a month, or 1.44 books a week. This is a brilliant series. Atticus O’Sullivan is a druid, born during the Roman occupation of Britain and currently living in Arizona, running a second hand book shop. He’s hiding from a few deities (and other supernatural creatures) who he’s annoyed over the centuries, but his quiet life is about to come to an end. Good character, good plotting, great humour. The series is a fantastic read. Probationary Constable Peter Grant is just trying to do his job, and avoid a transfer to the Case Progression Unit, when he interviews a murder witness who died a couple hundred years ago. The witness, not the victim. Then his life gets really strange. This series is so much fun. British humour, magic, the weirdness that is London (and surrounds) and fun characters. This is the first of a series. The other books are Moon over Soho, Whispers Underground, Broken Homes and Foxglove Summer. Rivers of London was also released under the title Midnight Riot. Humans have been fighting a century-long war with the Kreegan Empire, and they’re losing. Reza Gard, orphaned at a young age due to the war, is kidnapped by the Kreegans and forced to live among his enemies, but he may hold the key the fulfilment of a 10 000 year old Kreegan prophecy, and to the end of the war. Excellent science fiction, well plotted, good characters. Amazon link: Redemption. This is the complete text of the Redemption trilogy, Empire, Confederation and Final Battle. There’s a trilogy that discusses the start of the war, The Last War, comprised of First Contact, Legend of the Sword and Dead Soul, but I didn’t enjoy it quite as much. First Contact is excellent, the other two aren’t quite as good. A story of a search through an online virtual world for a massive prize, nothing less than the complete ownership of that virtual world and several billion dollars. Lots and lots of geek references, games, TV shows, movies, etc. What if magic was real? What if magic could be done by solving certain mathematical equations? What if that meant that computer programmers were actually magicians? That’s the premise of the Laundry Files. Magic is a branch of applied mathematics, and computers are really good at maths. Unfortunately, such magic tends to have unpleasant consequences, like interdimensional horrors eating your brain. Hence existence of a government department trying to keep magic under control, and put off the end of the world for a few more years. This is another series set (mostly) in London with more typical British humour. Amazon Link: The Atrocity Archives. Brandon Sanderson did a wonderful job finishing off the Wheel of Time series, now he’s starting his own epic fantasy series, and it’s good. The world of Roshar is scoured by hurricane-strength storms that cross from the east to west every few days. On this battered world kings and armies fight for power, for wealth and for legendary weapons called Shardblades. But there’s hints from various sources that something terrible is coming, something that will tear the world apart. Amazon Link: The Way of Kings. Depending on the publisher, the books are either sold in 2 parts or as a single book. The two published titles of the Stormlight Archive are “The Way of Kings” and “Words of Radiance”. 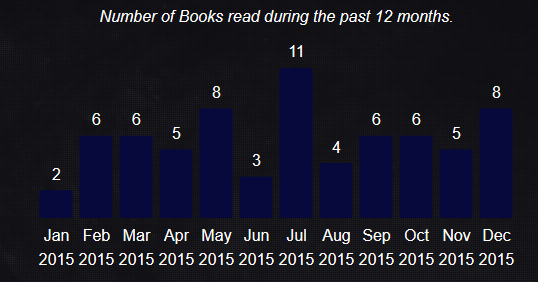 I only got through about 17 books last year, I should count out my average since I started tracking my reads in 2012. A friend turned me on to the Iron Druid series and I gobbled them like popcorn, typically powering through one of the books in less than 48 hours. I quite enjoy them especially since I’m from Phoenix and know the areas in Tempe that the early books were based in. I’m very fond of Stross’ Laundry novels. In fact, I was in Germany when the latest book released last July and was able to pick up a UK edition in Berlin. I was very happy doing that. His blog on antipope.org is a good read with many guest bloggers when he’s traveling or on deadline. Ready Player One is an excellent read, it was very high on my favorite books of that year. I haven’t read his second book yet, but I know a lot of people are disappointed in it. My wife got in to Rivers of London and is a huge fan. I haven’t read them yet, though I read a slash fic that she wrote that was quite good. I’ll get to them eventually, I’m currently reading a book that is the story of Iago from Shakespeare’s Othello.